Last night we stayed in a European style hotel in Sharm El Sheikh. This hotel is on the Red Sea. We enjoyed snorkeling and swimming in the Red Sea with tropical fish and corral. 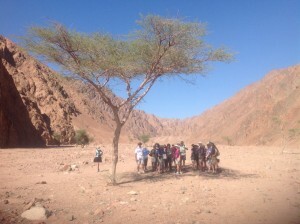 All afternoon we drove through the Sinai wilderness and mountain pass. George led us on a walk at the base of these mountains in a wadi. Our walk may have lasted 40 minutes in overwhelming heat but the Israelites endured the oppressive, desolate environment for 40 years. The border crossing from Egypt to Israel was thorough. Israel reminds us of of America, in sharp contrast to Egypt with its trash filled streets, abandoned buildings, and unfinished housing, because of it’s struggling economy still recovering from the revolution in 2011. Tourism is down almost 90% in this country. The Egyptians we came into contact with we’re very friendly and were most welcoming our group. Sarah, Jane, and Marina at the Egypt/Israel border crossing. 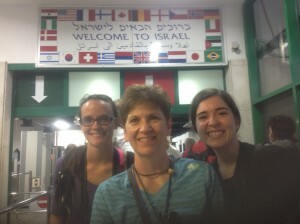 Donation for Israel: We’ve Arrived!